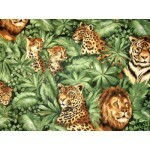 Here you will find all kinds of fabric with animals and birds as the theme. Quilting quality 100% cotton fabric. Price is per metre. Patchwork & quilting fabric. Beautiful Australian parrots on cream background. Quilting quality 100% cotton fabric. Price is per metre. Patchwork & quilting fabric. Beautiful Australian parrots on dark navy background. 100% Cotton. A toss of bright coloured dinosaurs on black background.